Pics of pretty much everyone! The Merrimack River trail race celebrated the 25th running with a perfect sunny and cool day. The field was arguably the deepest ever as the race was part of the USATF NE All-terrain series and named the USATF NE trail running championships. It also remains as the first event of the year in the WMAC “Grand Tree” Trail series. On the men’s side 23 runners dipped under 1:05 (the old record was 14) and 8 ran under 1 hour (the old record was 4). On the women’s side 15 came in under 1:20 (old record was 12) and 5 broke 1:10 (old record was 3). The women broke a number of records with Kim Nedeau (Acidotic Racing) leading the way with a new course record by 24 seconds (1:05:08). Kim also set a sub-masters record (age 35-39). Kath Hardcastle ran the third fastest time ever as the top four women ran times ranking in the top 11 all-time. Regina Loicano (CMS) broke her own masters age group record by 20 seconds (1:09:52). Marcy Schwam (aR) set a new 60+ AGR by 50 seconds (1:38:41). On the men’s side Brandon Newbould (WRT) became only the fifth repeat winner (he also won in 2014). His 6 second victory (57:39) was the 3rd closest finish. The two closer finishes are the two times I got 2nd place. Ben Nephew beat me by 3 seconds in 2000 and Craig Fram got me by 1 second in 1995. Newbould’s time was the 11st fastest and the next four across the line all scored top 25 all-time times (14, 18, 20, and 23 respectively). Although no men’s age group records were set there were some fast times. Patrick Caron ran the 3rd fastest in the 19&Under (64:01). Mike Galoob (BAA) became only the 2nd master to run under 1 hour (59:48) trailing only Tim Van Orden’s CR of 59:29. The top three masters all had times that rank in the top 10 all-time. Dan Verrington (CMS) ran the 2nd fastest 50+ (1:07:30) and the first three seniors times all ranked in the top 7 all-time. Jeff Saeger (TARC) and Bob Gillis (TG) finished within one second (1:19:35 & 1:19:36) running the 9th and 10th fastest Veterans times. George Gilder ran the 2nd fastest 70+ time (1:34:37) trailing only his AGR by 26 seconds. 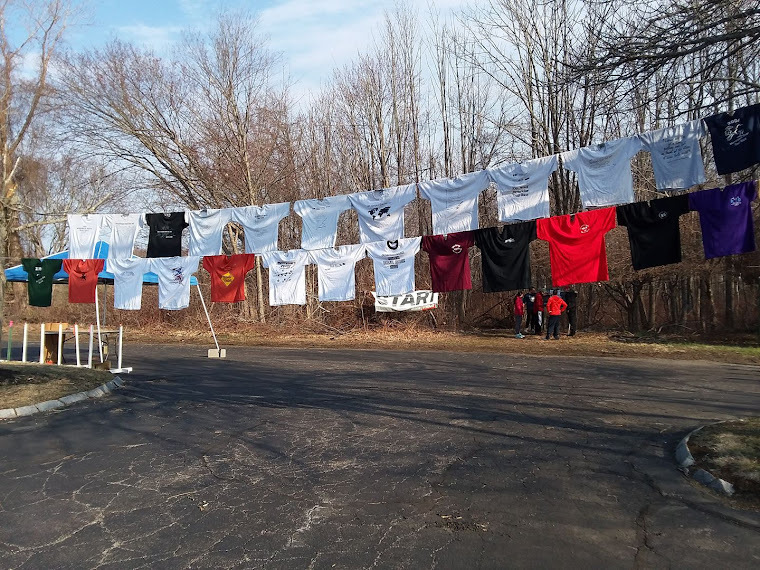 Jenn Brooks (CMS), Gary Jewett (TG), David Sorrells, Stephen Whittey (TG), and Kevin Yetman (MVS) joined the exclusive “100 mile club” with their 10th Merrimack River trail race finish. Paul Comeau became the third member of the “200 mile club” with his 20th finish. Tom Speidel is the top active streakers (consecutive finishes), he has finished all 25 of the races. Dave Geary (TG) has 14 consecutive finishes. Scott Spence (Grey Wolves), Chris Harrison (L-street), and Richard Georato have 11 consecutive finishes. There have been a few questions about the race being open to all competitors. It is! The New England championship is for USATF members but EVERYONE is welcome to compete in the race.